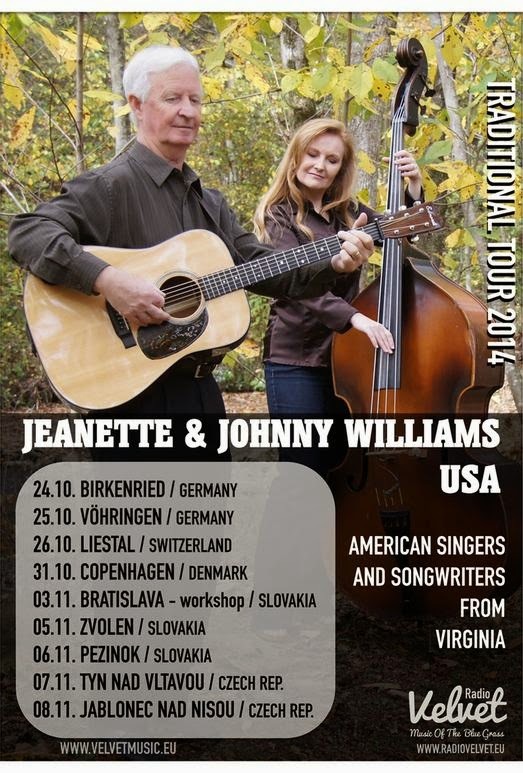 Jeanette and Johnny Williams are currently on a brief tour in Europe with the next date being in Copenhagen on Friday 31st October. Jeanette has accumulated no less than ten SPBGMA (Society for the Preservation of Bluegrass Music of America) nominations and was awarded Female Vocalist of the Year three times (2009, 2012 & 2013). On top of that, two IBMA Recorded Event of the Year Awards as part of the Daughters of Bluegrass as well as other songwriting awards including the Chris Austin Songwriting contest at MerleFest in 2007. As well as also winning MerleFest's Chris Austin Songwriting Contest (1998 and 1999) Jeanette's husband, Johnny is an award-winning singer and noted guitarist. Johnny also produced the two 'Close Kin' projects on Mountain Roads Recordings. These recordings - Close Kin and Close Kin: Our Roots Run Deep brought together Bluegrass and Old-Time musicians such as Adam & Tina Steffey, The Snyder Family, The Wolfe Brothers and the members of Rich In Tradition. Close Kin: Our Roots Run Deep brought together some of the finest young musicians including Lindsey Nale of Loose Strings, Jared Boyd, Daniel Greeson & Kitty Amaral. At the moment,there is no specific information about which venues are hosting Jeanette & Johnny's concerts but the Velvet Agency are handling the tour and they can be contacted via their website.